The holidays are right around the corner again. That means it’s time to visits friends and family, enjoy festive Christmas markets, go shopping for presents, show off your ice skating skills and, of course, drink some hot chocolate. What better place to get into the Christmas spirit than in our own capital? With countless celebrations and activities going on, we selected the best events and activities for you. 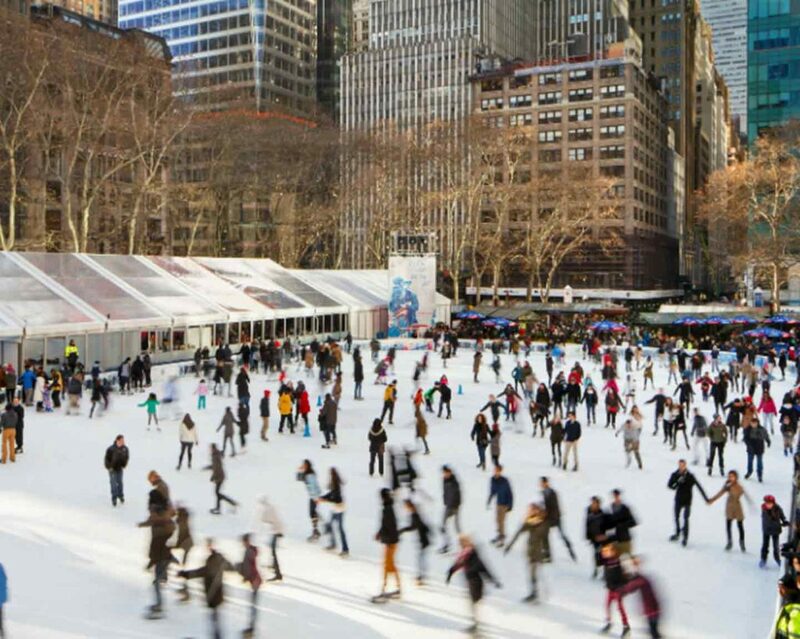 So, get your warm clothes, scarf and skates from the attic and jingle all the way …. to Amsterdam! It’s never really Christmas without the cozy Christmas markets, and in Amsterdam, there are markets of all shapes, sizes, sights and scents. Immerse yourself in the festive mood in Dam Square, Museumplein or Rembrandtplein – look for presents and winter delicacies at the decorated stalls or enjoy some delicious mulled wine at one of the many crackling fire pits. Of course, no Christmas market would be complete without a traditional Christmas tree. Dam Square features a 20 meter high tree, decorated with no less than 40,000 lights, harmonizing with the beautifully illuminated Bijenkorf. The tree will be lit on 8 December, so there’s ample time to get into the Christmas spirit! After all those waffles and chocolate milk, it’s time for some festive activity! Hop in an Uber with your friends and head to the Rijksmuseum, because between November 17th and February 3rd, the Museumplein will be transformed into a true winter paradise. Ice* Amsterdam is taking over the square to present a unique ice skating experience with the Rijksmuseum as the backdrop. Skate beneath a replica of the Magere Brug, covered with sparkling lights, and enjoy the Christmas feeling! Light up the night with Amsterdam Light Festival. From November 29th to January 20th, the Amsterdam Light Festival brings together visitors and international light artists during Winter’s darkest days. The colorful and sparkling works of art and installations are spread throughout Amsterdam – take an Uber and use the multiple destinations feature to get round them all in one go! The festival has developed into one of the largest light art festivals in Europe, so you’re sure to be impressed and inspired. Tip: Do you want to know how much the trips will cost? Then calculate the fare with this handy tool. Honored guests! Feast your eyes on the World Christmas Circus at Amsterdam’s Royal Theatre. During this 34th edition of the annual circus, you’ll get the chance to see hilarious clowns, spectacular acrobats and fearless Cossacks. It will also be the 250th anniversary of the classic 18th century circus, making this year’s extra festive and spectacular event one to watch. As ever, Christmas in Amsterdam is shaping up to be an unforgettable time. Get ready to celebrate with roasted chestnuts, warm blankets, skating circles, sparkling lights, Christmas wreaths and mulled wine all round!